Azad is the most popular Bengali poet in England. She is a bilingual author. She loves to tell stories and perform poems. She has written plays for theatre and published more than 30 books including novels, short stories and poetry both in English and Bengali. Her Bengali books have been published in Bangladesh and India by well known publishers e.g. Agami, Bidda, Maowla Brothers, Bahanno and UPL. Azad’s poems and translations in English were published in New Yorker, Majestic Nights by White Pine Press USA, The Red Beck Anthology of British South Asian Poetry, Velocity the 25 years of Best of Apples & Snakes by Black Spring Press UK, Modern Poetry in Translation and Mother Tongues by Kings College London. Her poems were included in Mid American Review, IR Indiana Review, Hayden’s Ferry Review issue 42 and Hayden’s Ferry Review issue 44 from USA. Her work was also published in Rising East Volume 3, The Emlit Project by Brunel University Press. She was one of the main writers of A Vauxhall Chorus: The 24 HR Book, ground breaking collaboration by Completely Novel.com and Spread the Word. She compiled and produced short stories on oral histories & heritage e.g. Voyages from Bangladeshi Writers Sunderland by Wear Books and Telling Tales The Life of Mr Aziz by Magic me UK. Her Boogley the Burgundy Cheetah a collection short story for children was published by Media Arial et Publications Canada. Azad is a columnist of Daily Prothom Alo in Bangladesh and Bangla Street in India. She has performed extensively at venues e.g. Museum of London, Poetry Café in London, Bangla Academy and British Council in Bangladesh. She worked for cultural Olympiad 2012 and performed in Edinburgh Fringe Festival 2011. 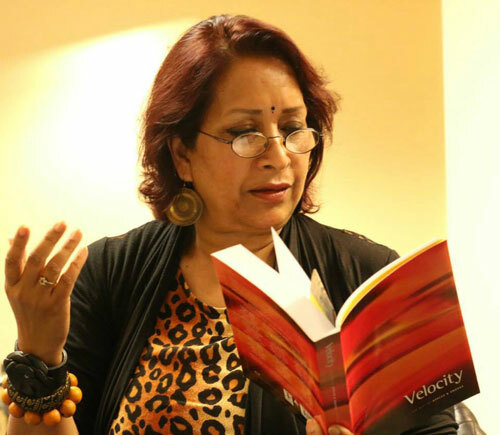 She is a resident poet and storyteller with Apples & Snakes, a member of the Poetry Society, EC member of Exile Writers Link, founder and chair of Bishwo Shahitto Kendro (World Literature Centre) London and a trustee of Rich Mix Centre.